If the full-size pickup segment were to open up with the ending of the 'chicken tax,' it could wipe out earnings at Ford, GM, and Fiat Chrysler. Like many automotive retailers, Scott Harris is anxiously watching to see whether the White House will move ahead with President Donald Trump’s threat to slap a 25 percent tariff on imported vehicles. Industry officials have long warned that tariffs could add thousands of dollars to the cost of a new car, truck or crossover and, at a time when the U.S. vehicle market is already softening, lead to a sharp downturn in sales — and American jobs. But some experts are now warning that the tariff war could backfire in an even bigger way, potentially costing Detroit’s Big Three their dominance in the profitable full-size pickup market. On most vehicles, the U.S. charges just 2.5 percent in duties — but as a result of an obscure trade battle back in the 1970s, it still levies a 25 percent tariff on foreign-made pickups that could compete with the likes of the Ford F-150 and Chevy Silverado. Known as the “chicken tax,” it has allowed Detroit to retain control of a segment that provides the three U.S.-based manufacturers virtually all their profits. “It would definitely make me nervous” if the chicken tax were to be lifted, said Harris, the new vehicle manager at Jorgensen Ford, a major dealer in the Motor City. “It would hurt everybody” in Detroit, he told NBC News. In 1964, President Lyndon B. Johnson decided to fight back when France and West Germany put hefty tariffs on American-raised poultry. He countered with 25 percent duties on a variety of European goods, including potato starch, brandy — and light trucks. Over the years, most of the tariffs have been lifted, but the 25 percent duty on imported trucks remains, and it isn’t just limited to vehicles produced in Europe but covers the entire world. Domestic automakers have long defended the restriction and, from their viewpoint, for good reason, said David Cole, chairman-emeritus of the Center for Automotive Research in Ann Arbor. The 25 percent tariff on trucks was “designed to protect a cornerstone of the (domestic) industry. That’s where the profits are. The last thing you’d like to see is product coming in and competing on price. That’s impossible with a 25 percent tariff,” according to Cole. 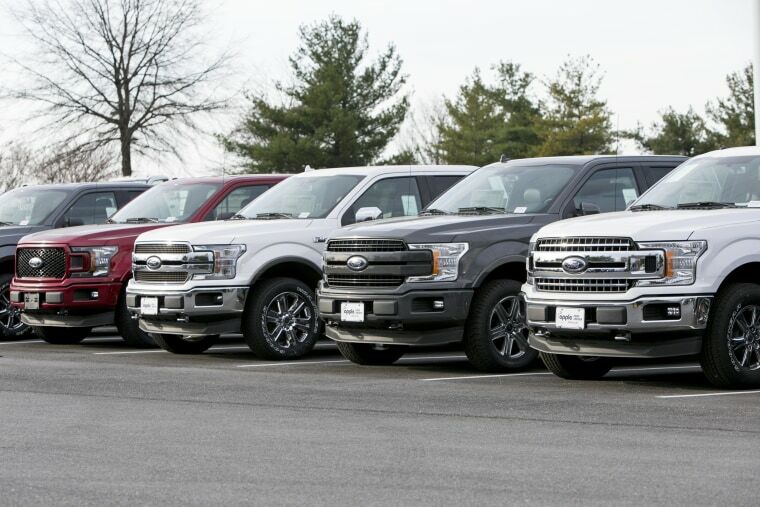 Pickups, especially full-size models like the Ford F-Series, are Detroit’s most profitable models. According to Adam Jonas, the lead automotive analyst at Morgan Stanley, the F-Series will generate about $42 billion in revenue this year, and yield more than $10 billion in earnings before interest and taxes. Measured another way, the F-Series alone is more profitable than McDonald’s, 3M, or United Technologies. The situation isn’t much different at General Motors, which actually outsold Ford in the full-size segment for the first half of 2018 — combining both its Chevrolet Silverado and GMC Sierra lines. Fiat Chrysler Automobiles is equally dependent upon its Ram pickup to bolster its bottom line. The chicken tax hasn’t been discussed much in the debate over the Trump tariff proposal, but it could become a major issue in the coming months. German Chancellor Angela Merkel, among other European leaders, has proposed heading off the looming confrontation by eliminating automotive tariffs entirely. It’s unlikely, analysts like Cole contend, that trade partners would allow the chicken tax to remain in place. That tariff hasn’t completely shut the door on foreign competition in the truck market. Daimler has used one loophole to build an American market for its big Sprinter van — also covered by the chicken tax — shipping partially assembled trucks to a plant near Charleston, South Carolina. Sales have grown large enough that Daimler’s Mercedes-Benz brand last year broke ground for a full Sprinter van assembly plant in West Charleston. Toyota and Nissan, meanwhile, have entered the U.S. full-size pickup market by setting up American assembly plants for their Tundra and Titan models. They’ve gained some market share, but only slowly, as full-size truck buyers are some of the American market’s most loyal. But Toyota overwhelmingly dominates in midsize trucks, in part due to the low-priced imports it shipped to the U.S. before the chicken tax went into effect. Detroit industry officials, speaking to NBC on background, worry that the same thing could happen in the full-size truck segment if the chicken tax were to go away. China, in particular, has been looking for ways to enter the American market. And India’s Mahindra & Mahindra, which specializes in pickups and SUVs, is openly looking to set up a U.S. retail network. Today’s domestic pickups aren’t cheap. The new Limited version of the Ford F-Series can approach $100,000 when fully loaded. Low-cost imports could be particularly appealing to contractors, as well as young buyers on a budget. Lower prices could help drive up demand, though most observers don’t expect to see massive growth in sales of full-size pickups, which typically account for around 11 to 13 percent of total unit sales in the U.S. More likely the result would be the sort of price-cutting that would cut deeply into earnings, with Detroit automakers showing a willingness “to ratchet up incentives” to maintain sales and market share, said Jeff Schuster, the head of forecasting for LMC Automotive. Earlier this summer, some Big Three models were offered with incentives of as much as $16,000. With the huge margins on their full-size trucks, automakers could afford the occasional price war, but givebacks like that aren’t sustainable, analysts like Schuster and Cole warn. If the full-size pickup segment were to open up with the ending of the chicken tax, it could wipe out earnings at Ford, GM, and FCA.